My husband is fast enough to catch both our bigger boys when they’re on the run. If you are not the parent of one of these children, let me assure you. These kids can fly. So once my second son came along, I feared I could never leave the house again. It’s one thing to sprint after my boy and leave the diaper bag on the bench. It’s quite another thing to chase him through the park with a baby. I can nurse a baby in my carrier while I spot my older son on the monkey bars. I can jog after a bolting kid without waking the baby sleeping in the baby carrier. I can even supervise a potty break with the baby in the carrier. My strategy is to get the baby out of his car seat first and put him in the carrier, then unbuckle my loose cannon once I’m ready and able to chase him. The best scenario is if I meet up with other adults to help me with one kid or another, but this isn’t always possible. And so. Babywearing. If you’re new to babywearing or intimidated by wraps and buckles, you might check out our Baby K’Tan carrier–it’s like babywearing lite! The two-piece wrap slides on quickly and leaves your hands totally free to yank any older kiddos down from the chain-link fences they’re trying to scale. Once your young baby is up and running in opposite directions from your toddler, my only suggestion is to invest in some good running shoes! 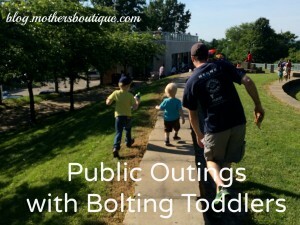 Did you brave an outing with a baby and a bolting toddler? Leave us a tip to share your best advice!